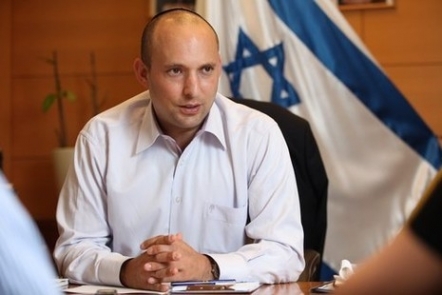 Gaza, ALRAY - The Israeli minister of economy and the leader of Jewish home party Naftali Bennett suggested a new plan for peace in Palestine calling to dismantle the security barrier in the West Bank and letting Palestinians govern themselves. In an interview Wednesday with Wall Street Journal Bennett said that Israel will not negotiate with a Palestinian government that includes Hamas, explaining that he will promote a Stability Plan throughout Israel's new Knesset legislative session.
" Palestinians living in certain portions of the West Bank (known as Area A and Area B) should govern themselves. They should hold their own elections, run their own schools, issue their own building permits and manage their own health-care system. In short, they should run their own lives. Israel should not interfere in day-to-day governance," he said. He explained that to achieve this plan Israel must allow Palestinians complete freedom of movement, which requires removing all roadblocks and checkpoints in the West Bank. In particular, Israel should dismantle the security barrier erected throughout the last decade to defend against what he claimed Palestinian terror attacks during the Second Intifada. He went on saying that Israeli occupation should work with the international community to promote the Palestinian economic development in areas A and B. According to him waiting for perfect solution to the conflict has affected the Palestinian economy. Up to his plan Israeli occupation would annex the remaining part of West Bank which is known as Area C and exercise sovereignty over it likes the occupied east Jerusalem and Golan Heights. It also would offer the full Israeli citizenship to the Palestinians who live there.
" This arrangement might not be the utopian peace Yitzhak Rabin and Yasser Arafat imagined when they shook hands in the White House Rose. Garden in 1993. But it offers Palestinians independent government and prosperity, while ensuring Israeli security and stability," he said.